3 Simple Ways To Get 17% More Seller & Buyer Leads With No Extra Traffic. Having a great looking website that ranks for top real estate investor keywords is important. But it is only half the battle. 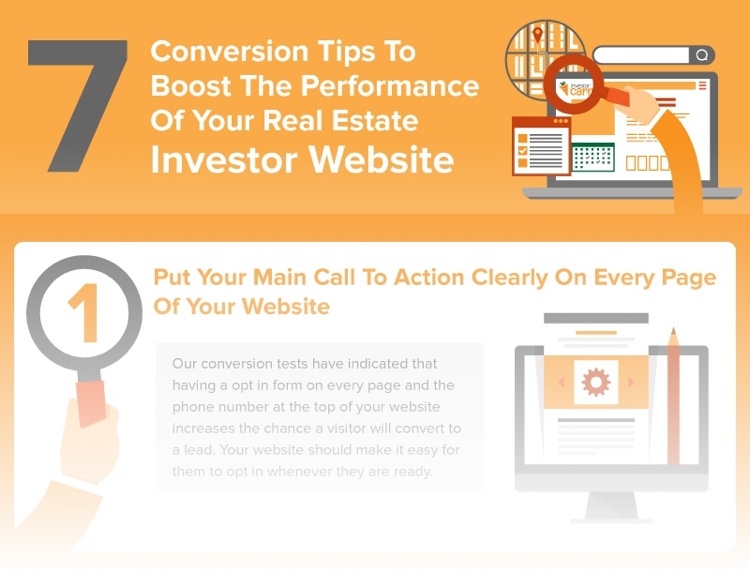 Many real estate investor websites fall short when it comes to conversion rates. The way your website is set up can often determine how likely a user is to convert. If your form has 12 fields to fill out before a user can submit a request to get a callback or a quote they will most likely abandon your website before completing it. Especially if a user is trying to fill out forms on a mobile device. Our testing has shown that 3-4 form fields are a sweet spot for leads to convert. Not only that but we have set up our website with a two-step opt-in process. Our websites ask for basic information upfront and pass that information to a second step. The psychology behind the second step is proven. If someone commits an act they will likely see it through to see the results of their actions. Filling out step two forms usually happens at a high rate on our customer websites. Because we pass the first form information over we are giving the user less work to complete step two. Not only that but for those users who do not complete the step two process the websites are still capturing a name and email. Our testing has found many subtle ways to increase conversions to find more motivated sellers, buyers, tenants, and note buyers. If you would like for your website to convert more leads, then this webinar replay might be for you. It is a long call but packed full of information. Give the webinar a view and then download our 16 point real estate investor conversion checklist. Carrot Sites have most of this optimization included out of the box!